Rural Brownville's greatest love is baseball and their greatest pride is their team's ace player, Ben Harding, "the slickest pitcher in the Boone County League." Ben works as a hired hand for Deacon Silas Nasby, who is more like a father to Ben than an employer. Ben dreams of being a professional ballplayer and spends all of his spare time either playing baseball or practicing his pitching. His only other interest is pretty Mazie Palmer "whose batting average is 1000% in Ben's affection." Of course, there's competition for Mazie's affections. There is an ongoing rivalry between Jim Blair, the banker's spoiled son, and our hero. One fateful day, a pro-team, the St. Paul Pink Sox, spend a few hours in Brownville because of a train delay. Ben happens upon the team tossing a baseball around at the train station. Not realizing who they are, he naively suggests they come to the baseball field to choose up sides for a game "if they know anything about ball." As a lark, they agree and soon learn just how good Ben is as he strikes out every slugger that faces him. The team's manager gives Ben his business card and says he may be able to use him one day. Life returns to normal country pursuits. At Brownville's Shadow Social Dance, the whole town shares in Ben's joy when he gets a telegram telling him to report to the Pink Sox' hotel in the big city of St. Paul. "What two months of praise can do to a perfectly nice boy." - Ben quickly becomes the Pink Sox' most successful pitcher, but success goes to his head. One teammate snidely comments, "The fans used to call him Hick Harding; it's Chesty Harding now." He becomes a dapper man-about-town and even hooks up with a gold-digging vamp, apparently forgetting all about Mazie. Unbeknownst to Ben, a large contingent of his biggest fans (i.e., the townsfolk of Brownville), including Mazie, have arranged to be at one of his games in Minneapolis. When Ben strolls into the ballpark, "late as usual," he sees the crowd from his hometown holding up signs and cheering and shouting. He hesitates, obviously mortified by their catcalls of encouragement and homemade signs. He decides to snub them and walks over to his new girlfriend, the golddigging Pearl Devere. Although he sees Mazie's pretty but shocked face, he ignores her and everyone else from the little town he would rather forget. It turns out not to be Ben's day. He pitches a terrible game, and the manager takes him out of the game. To add to his woes, his girlfriend lost money she bet on the game. Angrily, she snubs him. The Pink Sox' manager then gives him a severe tongue-lashing for his poor performance and cavalier work ethic. Ben, full of self-righteous pride, is not the least bit repentant. The manager has no choice but to fire him. A few months later, a train pulls into Brownville, and we see Ben stealthily disembarking - from beneath a boxcar - dirty and apparently living by his wits as a hobo. He returns as the "prodigal son of Brownville," ready to resume his simple country living. Can he redeem himself and win back Mazie and the rest of his hometown? The Busher is the kind of bucolic, formula picture that Charles Ray churned out during the most successful period of his career (1915 - 1923). Although the storyline is somewhat predictable, it is very entertaining. Baseball fans will appreciate a fond look back to an earlier day. 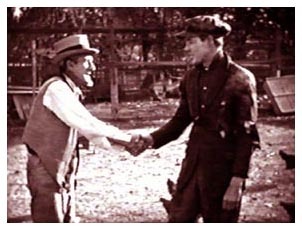 The Busher captures the rural Americana of the early 20th century very well, a time when almost every community across the country had a baseball team and the whole town would turn out for an afternoon game. The film has several nice touches that make it one of Ray's better rural comedy-dramas. For example, the big event of the week is the Shadow Social where the gents bid for the girl of their choice. However, the only clue they have to identify their sweetheart is her shadow projected on a large sheet on the stage. Although Mazie tells Ben how to identify her, he mistakenly, and successfully, bids for the town's grateful old maid. Of course, rival Jim Blair turns out to be the successful bidder for Mazie (assisted by a little "cheating"). The intertitle cards for The Busher deserve a special mention. Intertitle cards in general had an artwork all their own. While some simply had a line of dialogue, others were elaborately illustrated. Some may overlook the enhancement these cards provide; however, The Busher is a good example of the whimsy that could be integrated into a film and give it an extra special touch. Many of the illustrated intertitles are animated with a baseball sailing through the air and other charming devices. 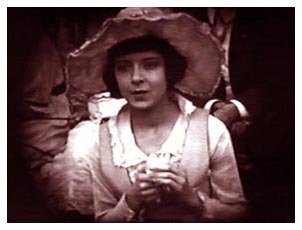 Certainly the nicest addition to the film is the presence of a very young Colleen Moore and future matinee idol John Gilbert. 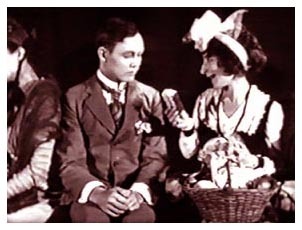 Moore plays the coquettish Mazie with charm and, at only 19-years old, is simply adorable. She was a few years away from her great fame as Hollywood's first screen flapper, but she displays a youthful charm that makes her more than an ingenue who serves as window dressing for Ray. 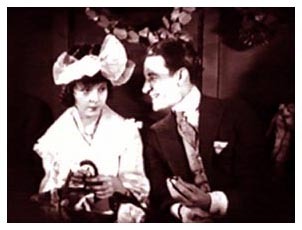 Moore was one of those special talents whose expressiveness and exuberance made her perfect for the silent screen -- actually more appealing than Ray whose portrayals tended to be very one-dimensional. The dashing young Gilbert makes a much handsomer suitor for Mazie than Ray's character, but, of course, he plays the stereotypical spoiled rich kid whom our heroine could never choose over the down-to-earth country boy. His character is not one that the viewer dislikes because of anything he does to hurt or harm our hero (except try to win the hero's girl away from him); he's just spoiled, rich, and, as it turns out, dishonest. His greatest sin is trying to "fix" the big game with Centerville so Brownville will lose (in order to pay off gambling debts) -- which, of course, just can't be tolerated by the viewer! As the silent film renaissance revives the careers of many forgotten performers, Charles Ray will be seen as the most successful portrayer of the shy, country boy hero in the silent era. Although his films may seem a bit maudlin to today's audiences, they give us a Currier & Ives kind of look onto the rural America of that period. The Busher is a very fine example of this film genre. Copyright 2005 by Tim Lussier. All rights reserved.